I spent all of last weekend in Seattle, celebrating my sister and her nuptials! 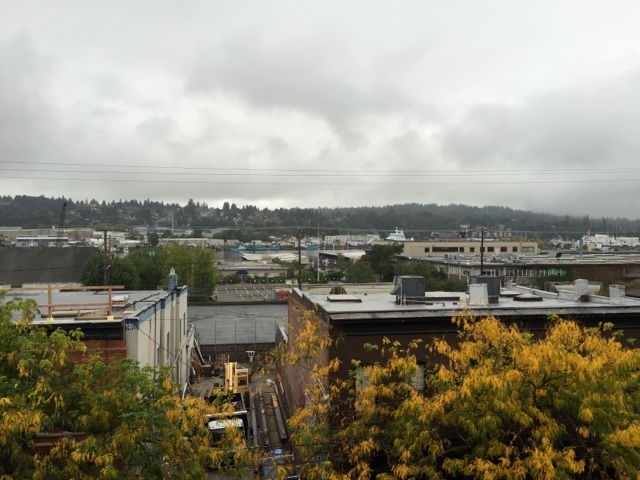 I haven’t been to Seattle in forever so I wasn’t really sure what to expect weather-wise. I’ve heard that they have a lot of rain so I pretty much packed for all contingencies. Thankfully, we landed to warm and sunny weather and actually ended up bumping into two of my cousins which made for a quick ride to the hotel! 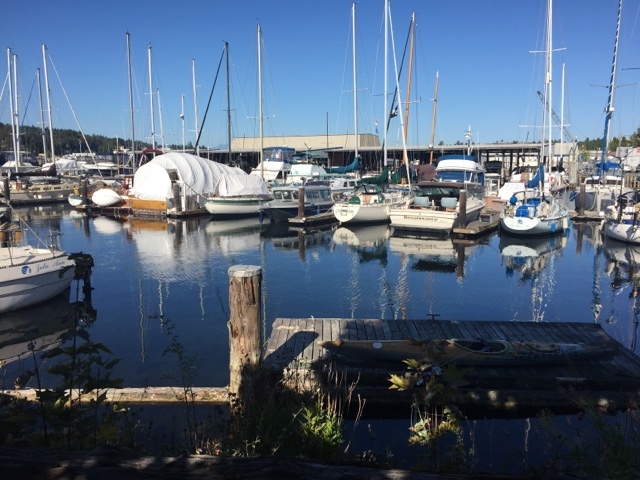 We stayed at the Hotel Ballard, which was located in this cute little hamlet in Seattle. 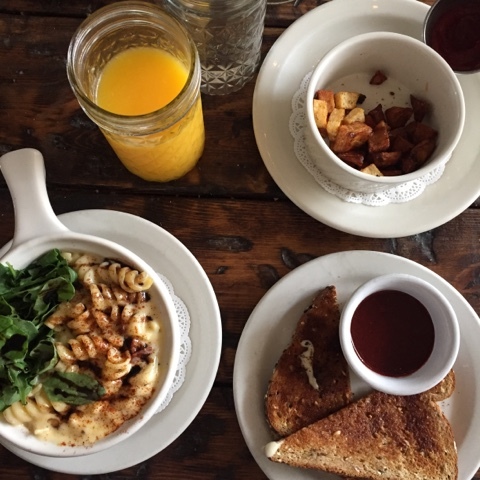 It was packed with tasty coffee shops, lunch spots and even had an awesome farmer’s market! 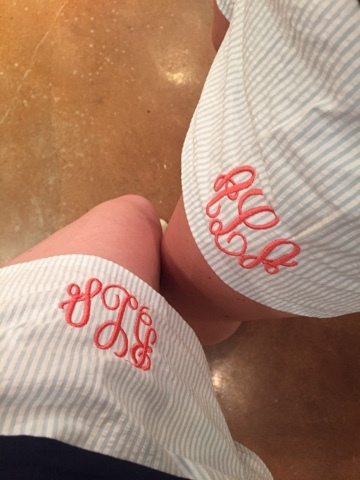 For the day of the wedding, the bride put together little packages for all of her bridesmaid which included a pair of monogrammed seersucker shorts and matching navy blue tanks to wear throughout the day. With all the hair and makeup and random tasks we had to get through, it was the best thing ever not to worry about what to wear in the morning. The shorts were also super cute! You know I can never say no to a cute monogram. 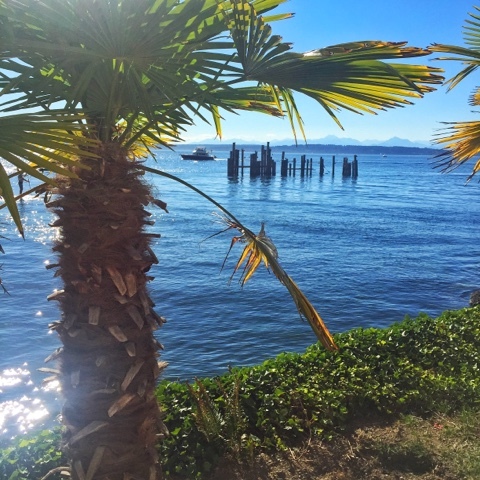 The location for the wedding was outdoors facing this beautiful waterfront area full of greenery and palm trees! 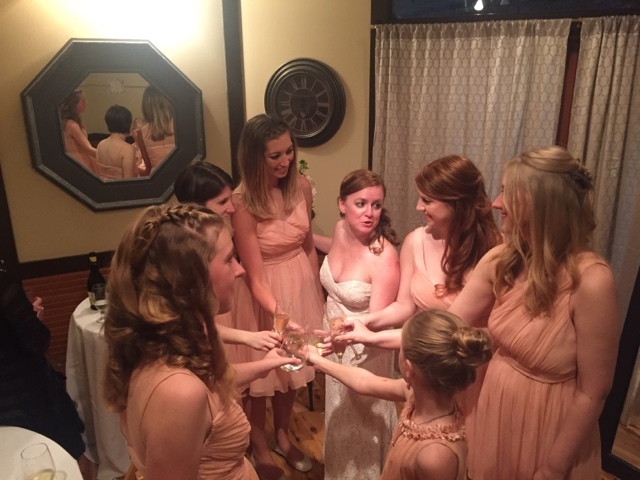 Right before we all took our places, my sister gave a toast to all of her bridesmaids, about how happy she was that we could all be there. We had to stop her from crying a few times. We couldn’t let her ruin her makeup on her big day! The wedding was huge success and we all stayed out pretty late enjoying the festivities. As for the tossing of the bouquet, there’s a hilarious video of my other sister and I basically avoiding it all costs. We think we’re a little too young for everyone to be thinking marriage. Our hotel room actually had this amazing little deck that we opened up on both days we were there so we could take in the fresh air and beautiful area surrounding us. It actually started raining on our last day, which I absolutely loved. It was sunny and hot for the wedding, but the last day made it feel like fall was actually here. Note: it’s been super hot and sunny in San Francisco and I’m just itching for some rainy fall weather to actually happen so I got very giddy when I saw falling golden leaves and rain in Seattle. Yup, I’m a weirdo. The Seahawks were playing on Sunday before we left and everyone everywhere seemed to be all decked out in Seahawks gear. I’ve never seen an area so into their football team. We went into a nearby restaurant to grab a late lunch and even the small hipster bar was filled with Seahawks fans watching the game on a projector by the bar. As soon as the game was over, the whole bar cleared out and it was only us and the bartenders. Crazy! 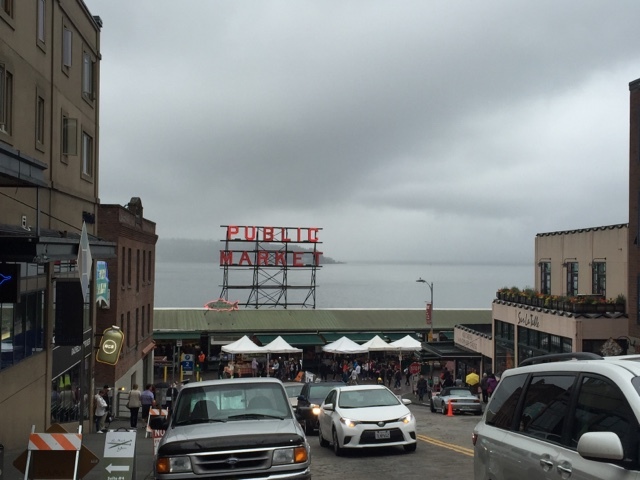 Obviously, we had to do the proverbial walk around Pike’s Place. Weird frizzy rain wouldn’t keep us from watching them chuck fish back and forth! We also got to check out the flower area. OMG. 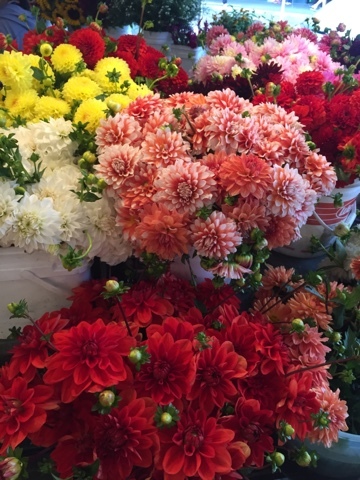 Seattle, you have the most amazing floral arrangements I have ever seen and so ridiculously inexpensive. Most bouquets I saw were $5 and the most expensive I ever encountered was $15. That’s crazy! You couldn’t get beautiful flowers like those for $5 in San Francisco. Someone tell me, what’s their secret? Ever been to Seattle before? What was your favorite spot? Share with me in the comments below! First of all, congrats on your sister's wedding! Oh, Seattle is on my places to travel before I die!! I want go to the parks, markets, the space needle, and all the famous spots!! I spent a weekend recently in Seattle for a friends wedding and I had never been before. It is such a beautiful place! I also went to pikes market and fell in love with all the dahlias 🙂 Such a gorgeous destination, I want to travel back again soon! Perfect wedding, thank you for sharing! I love the shorts!! And the dress colors were beautiful! Absolutely beautiful! Love the dresses, and the shorts 😉 And of course, I love Seattle! Totally feel the emotions with the weather and fall colors! Looks like a fun time. Thanks for sharing! I 'd love to visit Seattle sometime. Congratulations on your sister's wedding. I love the bride and bridemaids' dresses!